You will love, love, love wearing this one! 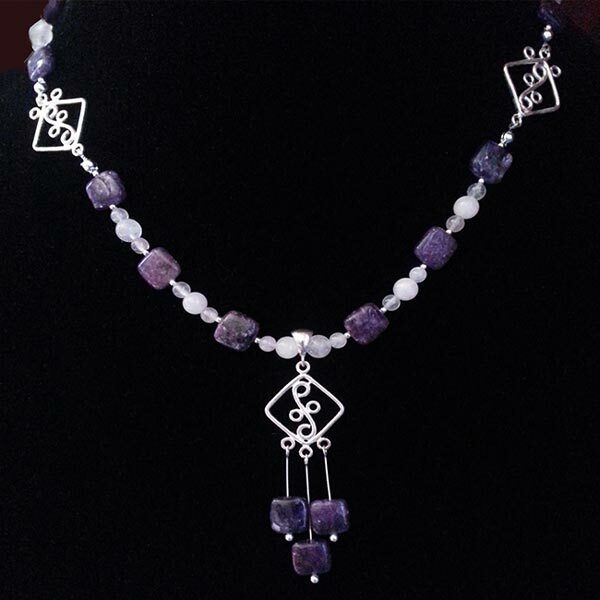 Sparkling Charoite and Rose Quartz make for an absolutely loving energy combination! Sterling silver accents and toggle clasp. Length is approximately 19". Add the matching earrings for a beautiful set! Raises energy from the earth up through us to the crown providing a more spiritual way to live on a daily basis. Helps to raise our awareness of things not in the material or physical reality. Assists in healing the physical body by making us aware of karma and our higher plan. Raises ethical levels making those who selfishly control others more morally aware. Charoite has a monoclinic crystal system and is generally considered to be in the silica family. For those who love the science of stones, it is a mixture of potassium, calcium, silicon, hydrogen and oxygen. K5Ca8Si18O46(OH)*3(H2O). It usually crystallizes in masses but can form as tiny druse upon a host mineral base. Its coloring can range from shades of deep purple to a pinkish purple with some areas of black. There can be swirls, or appear to be almost a solid color. It can also form with inclusions of quartz or manganese. Originally it was thought to have been named for the general geographic area where it was discovered about 70km away from the Chara River in Russia. Through further researching, I found it was more probably named for the impression that it gives which is called "chary." When translated from Russian, it means "charms" or "magic". Since it holds such transformative healing qualities, I can understand how the actual translation is probably more accurate than the general location name. While it is becoming more obtainable, I have found most of the tumbled that is regularly available in the market place is not a very high quality and have been disappointed with samples I have received. I think that it is probably due to what generally would be considered using the 'left overs' from jewelry cutting for tumbling purposes. I found meditating with this one a very relaxing and settling experience. In wearing it, I did find it added to my already helpful nature. Charoite helps to ground our spiritual selves back into reality by encouraging a path of service to fellow humans. It aids in opening and balancing our Crown Chakra and can bring us insights from past lives to address our karma personally and collectively. Charoite helps us to accept others as they are. It can release deep fears by bringing things more into focus as to how things really are, not as we imagine. It is a helpful one to assist in overcoming compulsions or obsessions by providing balance and removing the feelings of frustration that can fuel those behaviors. 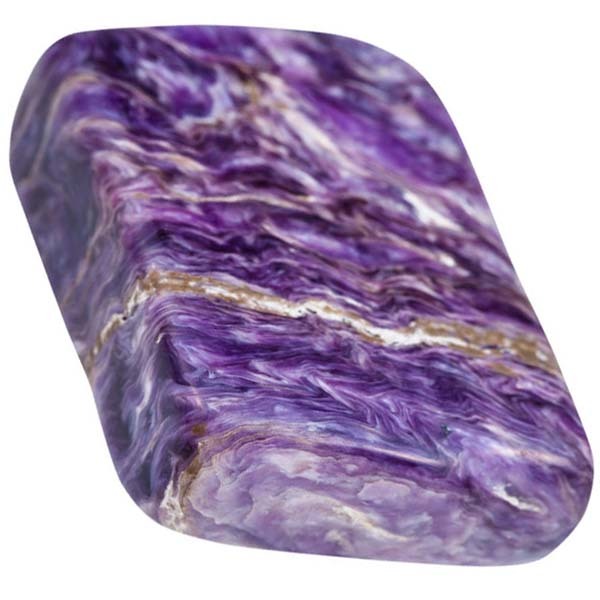 Charoite aids in stimulating our perceptive observations and analyzing capabilities to bring about quick decisions. A great aid for those who are driven by others thoughts rather than their own. Charoite energizes our body when exhausted, helps to regulate blood pressure, has been known to reverse liver damage due to alcohol use and can alleviate cramps, aches and pains. Charoite has a special affinity for Sagittarius and Aquarius, but benefits all signs. It has a Projective AND Receptive Energy, it's Element is Water and its Planet is Venus. Charoite is a fairly recent discovery in the gem world, so there isn't really any history or lore surrounding it. I guess we could say there is a mystery about it though. Why is this particular mineral found in only one location? Scientists speculate that it was formed under extremely rare and unusual circumstances that are almost impossible to duplicate anywhere else.